In response to enormous public pressure, lawmakers have rejected appeals by global corporations and voted to protect the country’s people and water supply by banning metallic mining. The people of El Salvador and their international allies against irresponsible mining are celebrating a historic victory. After a long battle against global mining companies that were determined to plunder the country’s natural resources for short-term profits, El Salvador’s Legislative Assembly has voted to ban all metal mining projects. The new law is aimed at protecting the Central American nation’s environment and natural resources. Approved on March 29 with the support of 69 lawmakers from multiple parties (out of a total of 84), the law blocks all exploration, extraction, and processing of metals, whether in open pits or underground. It also prohibits the use of toxic chemicals like cyanide and mercury. 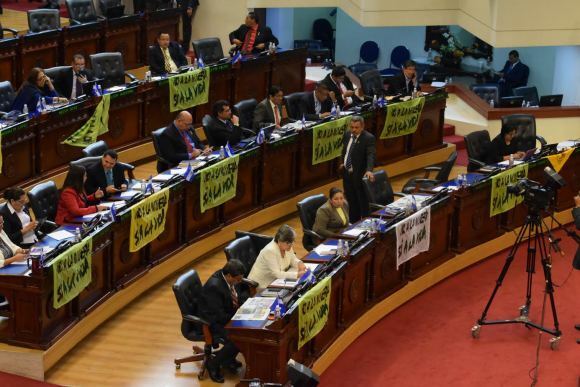 Members of El Salvador’s Legislative Assembly display banners reading “No to mining, yes to life” as they prepare to vote on a historic mining ban. Photo: Genia Yatsenko. In the lead-up to the vote, communities in the town of Cinquera had rejected mining through a local referendum and the Catholic Church of El Salvador had called for massive participation in a public protest to demand legislators to start discussions on the prohibition of mining. When the protest arrived at the legislative assembly, on March 9, they were greeted by a multi-party commission that committed to start discussions immediately and have legislation ready before the Easter holidays. Despite the fact that there is a national consensus among communities, civil society organizations, government institutions, and political parties for a mining prohibition, the Australian-Canadian company OceanaGold and its subsidiaries in El Salvador have consistently attempted to slow the bill’s progress and sought to gain support for their so-called “Responsible Mining” campaign. The global mining company OceanaGold had attempted to slow the bill’s progress. The company launched the campaign at a fancy hotel in San Salvador after losing a $250 million lawsuit against El Salvador in October 2016. The company had filed a claim with the International Center for the Settlement of Investment Disputes (ICSID), demanding compensation when the government declined to grant the firm a permit for a gold extraction project that threatened the nation’s water supply. In the face of tremendous opposition from a wide range of groups inside and outside El Salvador, the ICSID tribunal ruled against the company. When legislators announced that they would begin serious discussion on the mining ban, the company intensified its activities. Besides publishing paid communiqués in local pro-business newspapers, social organizations reported that OceanaGold representatives met with government officials to lobby against the bill. On March 23, a pro-mining protest was organized by the El Dorado Foundation (the foundation created and funded by OceanaGold) in front of the Legislative Assembly while the Commission deliberated over the bill. It was later reported by FMLN Representative Guillermo Mata, President of the Environment and Climate Change Commission, that the busloads of people brought by the foundation from the Department of Cabanas had each been paid $7 plus a free lunch to attend. They were also directed not to talk to the press. Also on March 23, Luis Parada, the lawyer who led the defense team for El Salvador in the ICSID case, denounced through his twitter account a letter sent by OceanaGold and its subsidiary Pac Rim containing veiled threats of further legal action should El Salvador vote to ban mining. These lawmakers have chosen water over gold, and people and the environment over corporate profits. But the push for a mining prohibition remained strong. To support the anti-mining coalition, Carlos Padilla, Governor of Nueva Vizcaya in the Philippines, visited El Salvador to share his province’s adverse experience with OceanaGold. On March 28, in presentations to El Salvador’s Environment and Climate Change Commission, Padilla reported that the mine had brought no significant economic growth, had violated human rights, and posed a threat to the province’s agricultural activity, the environment, and future generations. His testimony helped break down the myths of economic growth and responsible, sustainable mining propagated by OceanaGold. After Padilla’s presentation the legislators on the Commission unanimously voted to advance the Law to Ban Metal Mining to the floor of the Legislative Assembly. Also in advance of the assembly vote, many foreign organizations and individuals wrote to the president of the Legislative Assembly, Guillermo Gallegos, expressing solidarity with the people of El Salvador and support for the law. By voting in favor of the mining ban, these lawmakers in El Salvador have chosen water over gold, and people and the environment over corporate profits. And they showed that even a very poor country can stand up to powerful global mining firms. based in El Salvador, where he coordinates the International Allies against Metal Mining. Sebastian Rosemont also contributed to this commentary. Partager la publication "El Salvador Votes for Water over Gold"